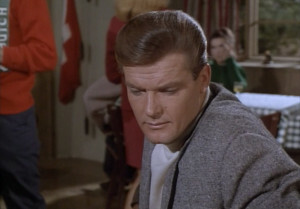 Roger Moore wears a smart casual outfit of a tweed jacket with a polo neck jumper in a fifth series episode of The Saint titled “The Death Game”. The jacket is made in a grey tweed with a small check and is in a button three cut with a little drape and natural shoulders. It has the trendy 1960s details of narrow lapels with swelled edges, short double vents and single-button cuffs. The open patch pockets allow this jacket to be worn more casually. The polo neck jumper is made in beige cashmere. The trousers are light grey wool, most likely in a cavalry twill weave. They have a narrow, tapered leg with plain bottoms. The hem is short with no break because of the narrow leg, and to compensate for the short length Moore wears black, short boots with elastic gussets on the sides. Though black boots go well with grey trousers, brown would be better suited for the country setting and casual nature of the outfit. From the second picture there, somehow I get the feeling that his legs are short compared to his torso. Is it because of the short pant legs or is it just an optical illusion due to the angle of the photo? Or I could just be imagining things.. I think it’s the short trousers. The low button placement also has something to do with it. Moore had disproportionately long and skinny legs which is why he always looks good in a suit. Nevertheless, this si an example of how fashion unsuitable to the wearer can distort the overall perspective. The sin of Sir Roger was be too much “trendy”. The Saint’s coats have lapels very skinny, exaggerated also for 60s. The trouble is that the Sir Roger’s chest is very broad,and ultraskinny lapels and ultraskinny ties seems grotesque on he. I don’t like neither the Moor look of late 70s/early 80s. Angelo (Vitucci) of Rome period is in my opinion one of worst. Of Lord Sinclair’s suit is better don’t talk: are funny,but after few years from Persuaders TV series seems already fancy period costumes. 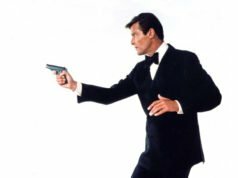 at the beginning of Moore-Bond age; the wardrobe for “Live and let die” and above all for “The man with the golden gun”. 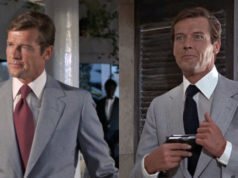 Those clothes (with another shirt and another tie) are elegant and timeless; relatively not many James Bond (see for exemple to double breasteds),but excellents well cut and classics. The “trendy details” look quite nice here, but the button stance is way to low in my opinion, even if I like a low button stance myself. 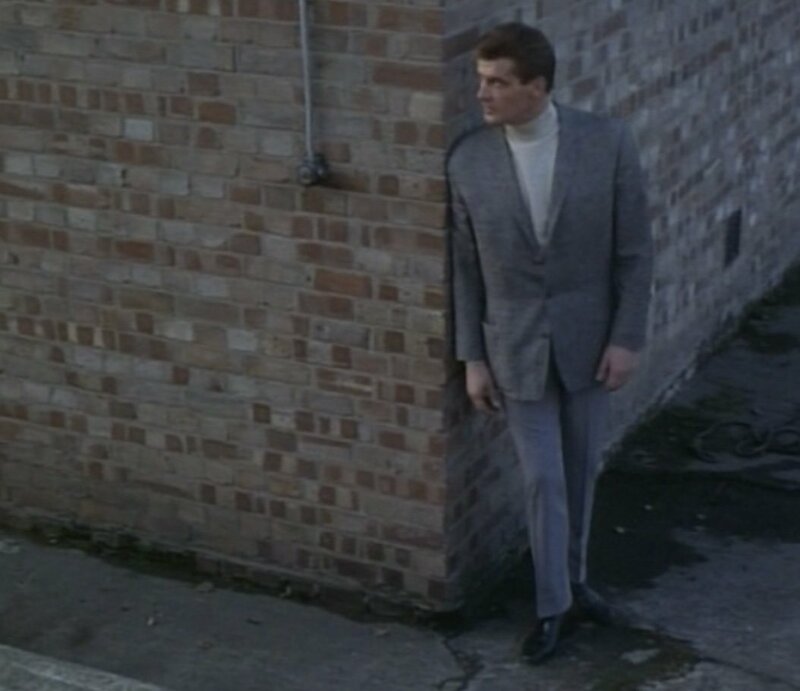 As it was the case with another Saint outfit, the little drape combined with a rather long (at least the button stance gives this impression) jacket and short trousers with a narrow leg make the ensemble look really not proportionate. Matt, could this button stance be even lower than the one on Moore’s Hayward suits ? The button stance is about the same as the Hayward suits. The button stance is indeed a little low, but the jacket length itself is just about right if one looks at where it ends with respect to his hand in the first picture. The lapels are also too skinny, especially for a large man, but on the whole the outfit is still nicer than many of the horrors we see today. And the tweed-and-turtleneck look is a classic! Pretty much a classic Moore 1960’s look. Actually Moore must have had a particular liking for this jacket as it first appeared sometime during the black and white run (not sure which season, but) I’m guessing 1963/64, then it turned up once or twice in this first colour series and even as late as 1968 in one episode of the final series. BTW, “The Death Game” was one of the best Saint episodes, IMO, helped by a nice, varied wardrobe. The combination of the skinny lapels, tapered, too-short trousers, low button stance, and drape in the chest make this outfit appear very unbalanced to my eye. I don’t mind any one of these features on its own, but the combination on Moore just doesn’t look very good. I’ve always thought he looked best with wider lapels and a clean chest.